Design matters! Looks matter! The way you present your content matters! Believe it or not – Most of the people are dumb enough to decide how a product or service is, by the way, it is presented. “Don’t judge a book by its cover.” – They say, but almost everyone, including me and you, judges based on looks – be it products, commodities or even people! The same applies to literally everything – including the PowerPoint presentations you rely on for speeches! Why being professional with PowerPoint is important? Today’s people have a really low attention span. You have 90 seconds – yes just freaking one and a half minutes to prove that you’re really worth their attention, and there’s no guarantee that they will hold on their attention even after they’re impressed. Relate this with your PowerPoint presentations that you deliver at your workplace. Sure, PowerPoint is a really an awesome tool, with dozens of free designs to improvise the looks almost instantly, but that’s just an old school now. Everybody knows that the predefined template is just a click away, and most of them are so frequently used that people don’t find anything interesting in them! Let me explain this illustratively. Which one of the below slides is more appealing? 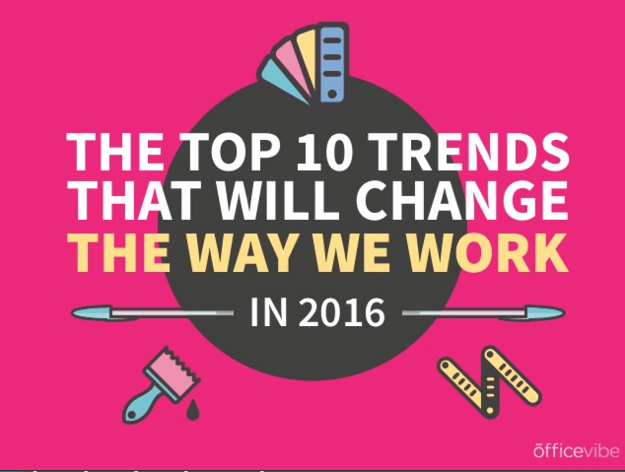 The content remains the same, but notice how the change in design MAKES A DRAMATIC IMPACT ON YOUR MIND. The first one is yet another predefined slide design while the second one is a customized PowerPoint template you would have probably never seen before. The second design has clip-arts and powerpoint diagrams arranged in a remarkable manner. Therefore, we should accept that, even if the content of your presentation is full of damnation awesomeness, it won’t be as influencing as it should be if it lacks the support of a unique and appealing design. So what can you do the next time you’re supposed to make a PowerPoint presentation, and you want to leave an impression on your target audience? You need various elements such as excellent templates, maps, charts, PowerPoint designs and PowerPoint diagrams. Hiring someone might be way too expensive for you. I have a one-time solution for this that requires a measly investment. It’s www.poweredtemplate.com – An Awesome Arena for Presentation Templates, Wo rd Designs, Print Designs and Website Templates. PoweredTemplate is an excellent place for unique presentation templates. Imagine how awesome it would be to make a strong impression for a little investment with PoweredTemplate! Your project won’t be complete just with a beautiful template. PoweredTemplate extends some help on the content part too! PoweredTemplate offers add-ons such as Maps, PowerPoint Designs, and PowerPoint Diagrams. A single map would give you more than 50 slides – with every minute detail covered. For example, if you purchase the US Map, you will get 63 slides covering the main country and cities. You can use any of those parts any time in your presentations and leave a drastic impact on your audience. Talking about the PowerPoint Diagrams, they will make your day! The toughest part in a presentation is arranging the statistical data. With PoweredTemplate, you can get those designs pre-made for you and you will just have to add your desired text! How simple does that become? PoweredTemplate also offers Word Templates, Print Designs for brochures, Website Templates, Clip Arts, 3D Diagrams and more. Forget everything else – let PoweredTemplate be your one-stop destination for your design needs. Every template or design at PoweredTemplate is created by designers who are just awesome at their work. They know what works for what category and what color combinations appeal the most to the audience. They are geeks well versed with all the elements and rules of design – and you can surely rely on them! Be it Templates for PowerPoint, Clip-Arts, PowerPoint designs or PowerPoint Diagrams, there are experts in every field. Look at this link https://charts.poweredtemplate.com/powerpoint-diagrams-charts/presentation-templates/0/index.html to find out diagrams and Charts that you can use to make your PowerPoint Presentation more effective. PoweredTemplate has been chosen by big guns such as Sony, Mercedes Benz and Vodafone for their website template requirements. Imagine how awesome PoweredTemple is it then! With such a vast collection of templates for PowerPoint on PoweredTemplate, I doubt whether someone would have seen your selected design beforehand anywhere. But still, if you want to ensure your design is unique and remains that way forever, you can ask for a custom template. PoweredTemplate team would build a professional template which would be reserved only for you and nobody else. Get a custom template, for just $195. How to Download Templates For Free? 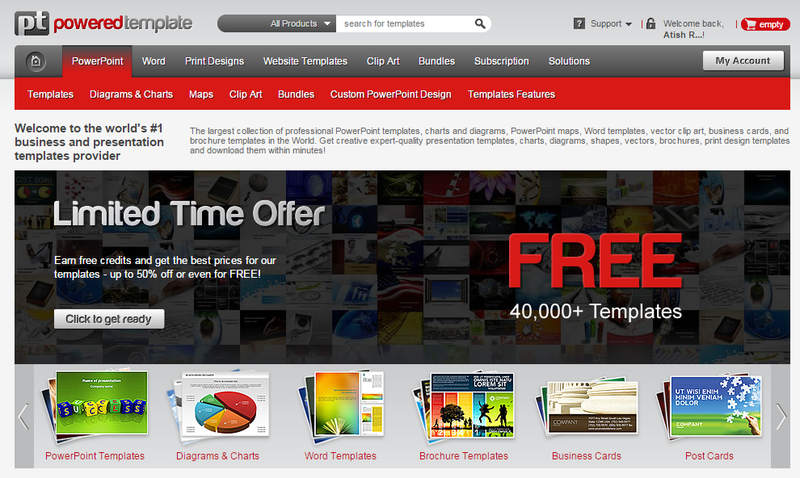 For a very limited time, PoweredTemplate is offering a free template download feature. 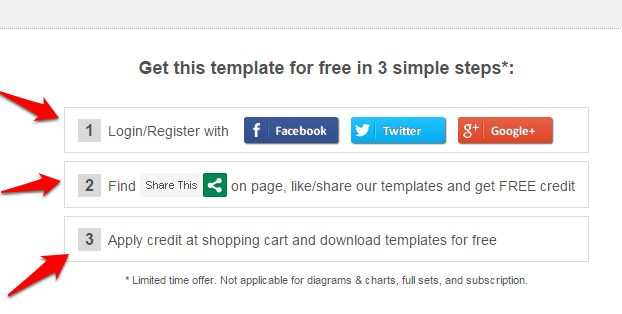 Log-in to PoweredTemplate, make a few social shares to earn credits and use them to get a free template of your choice! You can use this feature to give PoweredTemplate a shot, before thinking about getting a subscription! If you want to make a one-time purchase, you can directly buy any template or design at the price mentioned below it. 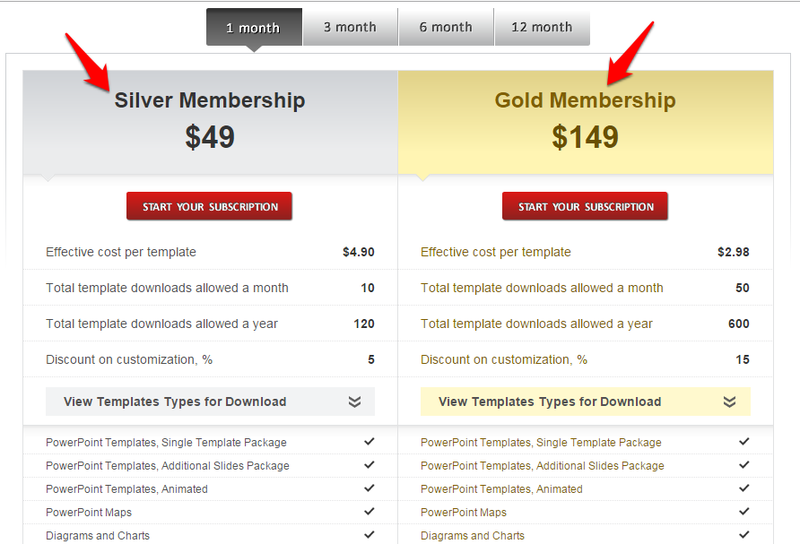 But if you want a long term business, you can subscribe to a membership which can give you templates for a cheaper rate. The rates go down to as low as $1.33 with a membership. The Silver Plan has almost all the features you will need to get started. The Gold Plan, however, has many additional features you might need at times. Also, there’s a difference in the number of permitted downloads per month in both the schemes. You can either subscribe any plan for 1 month, 3 months, 6 months or 12 months as per your requirement. 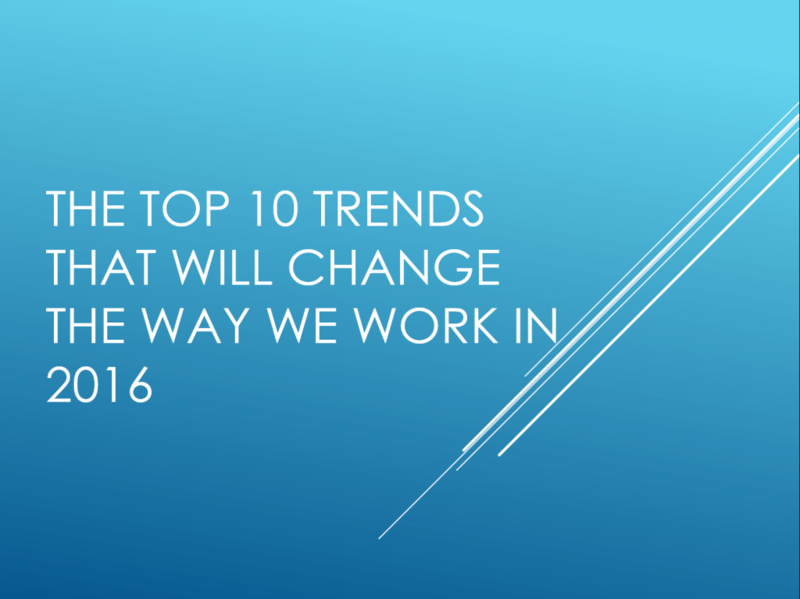 Check more details here. PoweredTemplate is a one-stop solution for all your design related needs. For PowerPoint, they have templates for PowerPoint, clip-arts as well as PowerPoint Diagrams. With such broad categories and a dazzling range, I don’t think you will ever need to rely on any other place for all your template (or PowerPoint Diagrams, etc.) related problems. The pricing is fairly cheap as well. There’s an affiliate program to which you can use to make money. Just invite your friends to join you at PoweredTemplate, make them buy some templates for PowerPoint presentations they would need to prepare, and get paid for that! To conclude, you need to try PoweredTemplate at least once to how awesome and useful it is.